Saying in southern Wushu: "Merge the boxing and qi into one." It means that the boxing origins from the qi. Therefore the Nanquan players must practice the internal exercises for life-enhancing. 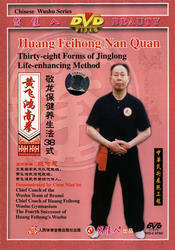 The Jinglong Life-enhancing Method is combined with the essential of the internal exercise of Buddha school, Sun-style Taijiquan, Wu-style Taijiquan, Liuhequan (Six Conformities Boxing) and so on, and it forms the unique South Boxing Life-enhancing Kung fu. It emphasizes that the abdominal respiration settling qi to Dantian and massaging the acupuncture points by energy. It has good effect on improving the function of heart and vein, respiration and digestive system, and accelerating the metabolism.